This report, authored by Tom Gibbons, a former Quality Manager and Plant Manager, documents the impact of the installation and use of XRSciences APEX Cross Belt Analyzer and APEX Upgrade package at the Buzzi Unicem Portland Cement Plant located in Maryneal, Texas. This document is based on discussions with Plant Personnel at the Buzzi Unicem Plant. /// The Buzzi Unicem Portland Cement Plant in Maryneal, Texas, manufactures Oil Well and Type I/II Portland Cement. The facility recently did a major upgrade that more than doubled the clinker capacity. Three existing preheater kilns were replaced with a single, state-of-the-art preheater/calciner clinker production line. Today this plant now has the capacity to produce over 3,000 metric tons per day of clinker. The upgrade replaced the three kilns, preheater towers, clinker coolers, and feeders, in total about 80% of the plant was rebuilt. The plant’s alumina source is high in the alkali potassium. If potassium levels get too high, the raw kiln feed mix must be altered to meet the ASTM designated limit of 0.6% total alkali content in cement. Intermittent excess magnesium and sulfur levels in the limestone can also be an issue from the quarry, requiring continual monitoring and adjusts for magnesium and sulfur levels. The control strategy is to blend two types of quarried limestone, a high-grade stone designated as “Creamy” Limestone and the more abundant “Regular” limestone. The Regular stone has high variations in MgO (up to 20%) and SO3 (up to 3%). All limestone is stored in an enclosed stockpile with twelve feeders for blending the two grades of limestone into a single additive bin. Additionally, high grade limestone is also stored in a dedicated sweetener silo for more controlled metering. Using the Cross-Belt Analyzer, the blended and high grade limestone are included in the control strategy to automatically yield consistent MgO under the maximum threshold limit for magnesium. Thus, the two types of Limestone are pre-blended into one limestone of consistent quality, with MgO maintained at or below target levels. If the resulting mixture is too rich in Calcium, silica sand is added to reduce calcium content such that the proper ratio of calcium-to-silica is maintained. In addition to the sand feeder, there are other feeders for high alumina clay and iron ore. Consequently, the Cross-Belt Analyzer controls the blending of all raw materials such that threshold levels of alumina, iron, magnesium and alkalis are all maintained, while simultaneously maintaining the critical ratio of calcium-to-silica. Figure 3 – The analyzer is in the building shown. Figure 4 – The APEX Analyzer. This was installed in 2016. The electronics was upgraded to the APEX Electronics in 2017. Figure 5 – The APEX analyzer in operation. 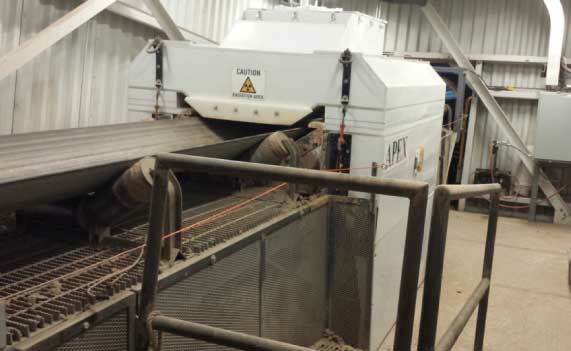 As part of the upgrade, Buzzi installed a Cross Belt Analyzer and Process Control Software to automatically monitor and control all oxides within the limestone mix. 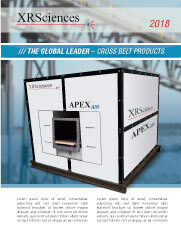 They purchased and are using the XRSciences APEX Cross Belt Analyzer. 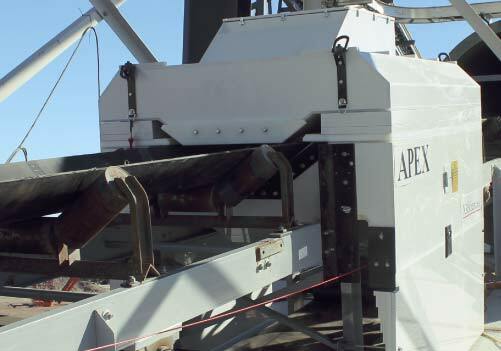 The APEX PGNAA Analyzer is critical for (1) meeting all raw mix targets for kiln feed, (2) holding magnesium and sulfur content below threshold limits and (3) for minimizing raw material costs by keeping expensive purchased materials at minimum addition rates while simultaneously assuring that potassium and magnesium levels are kept under control. Accurate and consistently reliable cement raw material oxide readings from the analyzer assures that high quality clinker, manufactured by the new pyro-processing system, can be produced at the lowest possible cost. 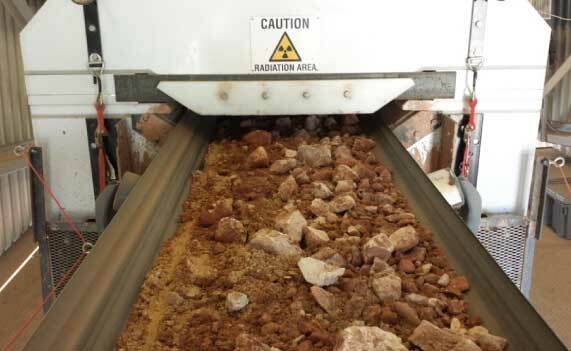 Raw mix production ranges from 275 to 325 tons per hour, with typical a production of 300 tons per hour. The site objective is to make the absolute best Raw Mix possible to insure stability in the burning process. The experience of personnel at Buzzi Cement is that if the raw mix is good, the rest of the operations fall in line. Poor control of the Raw Mix can cause all sorts of issues. In order to deliver the best Raw Mix, Buzzi Unicem needed a PGNAA cross belt analyzer that delivered highly stable, accurate and reliable measurement data. They wanted to ensure that they obtained measurement data that did not drift or require constant adjustments or offset corrections to compensate for analyzer calibration drifts. Essentially, the more accurate, stable and drift-free a PGNA analyzer is day after day, week after week; the better their ability to closely monitor and control the raw mix operations, and thus reduce costs and minimize raw-mix associated operational issues. Prior to the analyzer selection, XRSciences had received multiple Research and Development (R&D) Grants from the US National Science Foundation (NSF) to “Significantly Advance the State-of-the-Art” in PGNAA technology, and as part of this work, they contacted 40 cement plants/companies, including visiting the technical center of Lafarge, Italcementi, Buzzi Unicem, and others. From Dr. Atwell’s NSF-funded visit, Buzzi Unicem personnel were aware that XRSciences was working to “Advance the State-of-the-Art” in PGNAA technology. Buzzi personnel had also previously worked with Dr. Tom Atwell when he developed the CBA, ASYS and Omni analyzers. Buzzi Unicem is well known for pioneering advancements in cement manufacturing technology. For this reason, and because of their experience working with Dr. Atwell, the XRSciences APEX analyzer was selected. Consequently, the very first APEX analyzer was purchased and installed in 2016. The system initially used legacy electronics, which were then upgraded when the improved APEX Electronics Upgrade became available in mid-2017. “We have found that the APEX analyzer and Electronics is very stable and accurate. We monitor the analyzer results, comparing them to lab data obtained from the analysis of a continuous automatic raw material sampler. We can go for four to five months before we need to do any adjustments. This is despite the fact that we are at fairly low source strength. This is also true when we switch cement types — with the new APEX electronics, the analyzer does not require an adjustment or correction. It did require an adjustment in the past, but this is no longer needed with the upgraded APEX electronics. There are some big implications when you can trust the analyzer results and the system is stable over time. We are now making decisions based on the analyzer data, and not relying solely on the lab analyses. We are using the analyzer for more than just trend analysis. We are doing real-time adjustments to our process. This has taken a change in perception of the analyzer and a mental shift from using the lab data to trusting the analyzer data instead. The result is that it makes the entire operation more efficient. My work is more efficient, the lab guys are more efficient. We spend more time monitoring the process and less time doing lab analyses. We were able to go from preparing lab samples every two hours, to every six hours. So we spend less time doing lab analyses and more time focused on monitoring and controlling the process. The site reported that the analyzer electronics produces very stable and reliable results. They track the lab-versus-analyzer data, making adjustments only once in every four to five months. Further, they were able to reduce sampling frequency from every two hours to every six hours. Using the analyzer feedback, raw mill LSF standard deviation has dropped significantly . The end effect is that they have shifted the operation from using the lab and they are now are monitoring and controlling the raw mix process automatically using the measurement data from the Cross Belt Analyzer–in real-time (exactly what the analyzer was designed to accomplish). They also report that this has made the group more efficient, as they are spending more time monitoring and controlling the process and less running lab samples. Buzzi Unicem also reported that they are in the process of purchasing additional APEX Electronics upgrades to upgrade existing CBX, CB-GN and ASYS systems. Tom Gibbons, author of this report has extensive experience in process engineering and plant management. He was a former Quality Manager and Plant Manager, and was responsible for installing the first PGNAA analyzer in the cement industry.